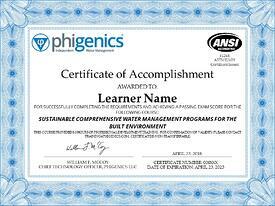 The purpose of the Phigenics course is to enable learners to improve facility water system safety and efficiency. The course is in alignment with published industry standards and guidance including ANSI/ASHRAE Standard 188, the CDC Toolkit, and ANSI/ASHRAE Standard 189.1. All instructors have at least 3 years of experience in the building water management industry. *Fees must be paid 14 days in advance of the scheduled course. Cancellations and refunds are not permitted, but fees can be applied toward a future training event. Phigenics offers organizations the opportunity to pair this training course with a related industry event (conference, symposium or summit). As an all-day training, we frequently partner with an organization to offer a course pre-or post-conference to maximize learning and increase attendance to your event. These fees are negotiated rates based on establishing a training agreement with your organization. For more information on partnered courses, please contact Michelle Maher, Marketing Coordinator, at mmaher@phigenics.com. Phigenics offers this course and other training to local building owners or as an on-site training for a group of employees within the same organization. Please contact Michelle Maher, Marketing Coordinator, at mmaher@phigenics.com to inquire about course offerings, logistics and fee structure. What does a certificate from Phigenics mean? A Phigenics Sustainable Comprehensive Water Management Programs for the Built Environment Training Course certificate holder is equipped with the knowledge that enables them to improve the safety and efficiency of building water systems. CEUs may be available. Contact your organization for their specific requirements. Sustainable Comprehensive Water Management Programs for the Built Environment Training Course provides 7 hours of professional development classroom training. To register for a course click on the event date below. What can I expect in the course? This course is intended for those learners wanting to better understand the fundamentals of Water Management Programs, or WMPs (water safety and efficiency initiatives). The course focuses on a 7-step process of administering a WMP (WMP-101). 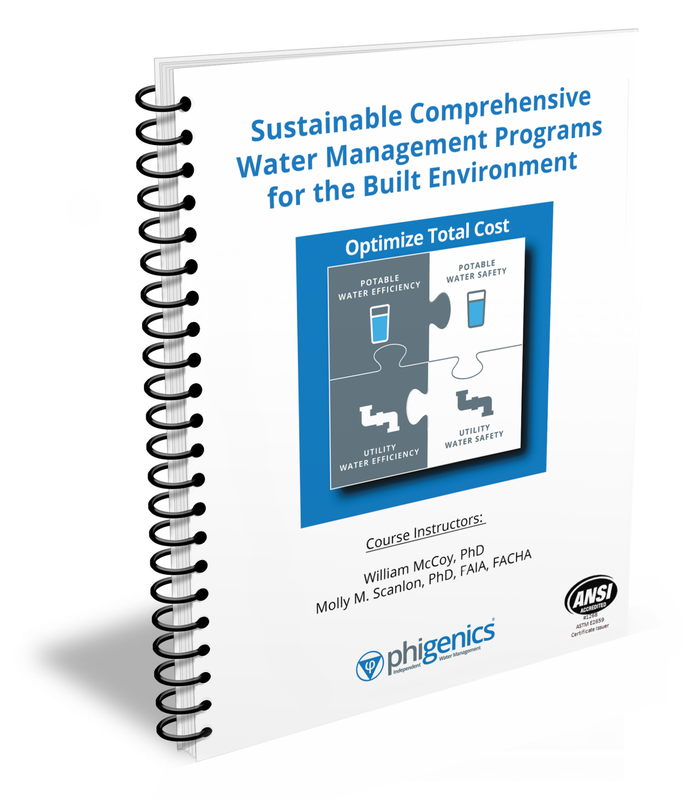 It serves as a primer for those who need to lead, administer or participate on a WMP team within an organization or advise others from a public health agency perspective about how to responsibly manage water systems in buildings for safety and efficiency. The course is not meant to give specific information on waterborne pathogens, at-risk populations or epidemiology. Additionally, this course is not about chemical treatments or products used. It is a neutral learning environment to gain knowledge about WMPs. Does this course cover Legionella risk management? Yes. The course covers the use of ASHRAE Standard 188 and the 7 steps of a WMP for safety and efficiency. A WMP is a process that is effective in reducing risk (illness, injury and death) from many waterborne pathogens, including species of Legionella and Pseudomonas, among others. The course emphasizes the process for managing building water systems through hazard analysis and control; it does not cover the history or analysis of any specific pathogen. Our organization has properties in the US and other countries. Does the course explain how the World Health Organization (WHO) Water Safety Program compares to ASHRAE Standard 188? Yes. The course materials and instructor will discuss the similarities between policies and best practices utilized in water management for building water systems. A chart is provided illustrating the alignment of the 7 steps of the WMP process in ASHRAE Standard 188 and WHO Water Safety in Buildings 2011. The course is not primarily about municipal water management systems, which are governed under different types of water authority jurisdictions. Which standards is the course content based on? Yes. Because of the full agenda and concentrated time for learning, we include an on-site lunch in the registration cost. Are the course materials mine to keep and make notes in? Yes. You will receive a course booklet and a current copy of ANSI/ASHRAE 188 (2018) for you to keep and mark up during and after the course offering. We recommend you bring a writing instrument to make notes and take the examination. The exam is graded as pass or fail. We do not report to each learner which questions were passed or failed due to the number of learners taking the course. The exam is 50 questions answered as multiple choice or true/false. All exam questions are covered during the course offering and the exam is “open book,” meaning the learner can use the course materials provided to answer any of the exam questions during the 60-minute exam time frame. A passing grade has been determined by analyzing the assessment questions and determining what score would reflect a learner reaching basic understanding of the concepts. When and how will I be notified of my final grade? Each learner will be notified by email within 30 days of completing the exam with notice of a pass or fail grade. When will I receive my printed certificate? Each learner passing the exam will earn a certificate. An electronic certificate will be provided via email upon notification of a passing grade. The certificate will be mailed to each learner at the address provided during the registration process within 30 days after completion of the course. How can I receive a continuing education credit? Phigenics does not directly provide any continuing education credits (CEUs), and we do not file your CEU documentation. If the course is offered through a partnered conference provider, that organization may commit to accepting the course credits for their organization’s CEUs. That will be determined on a case-by-case basis with each partnered conference provider. Additionally, note that most organizations will accept what are referred to as “self-reported” CEUs by submitting: 1) an agenda of the course, which is available in the course booklet, and 2) a copy of the certificate showing you passed the course. It is up to each professional organization to accept or deny your CEU credits (i.e., Phigenics has no control over other organizations’ acceptance of CEUs). We suggest you contact your professional organization prior to registering for the course and explore the requirements for “self-reporting” your CEUs to effectively submit your information after completing the course with the correct information to your organization. Personal information that is collected will be treated as confidential. Personal information includes certificate holder name, address, telephone numbers, emails, assessment scores, certificate status (except for an individual who has achieved a certificate). Confidential information about a particular individual will not be disclosed to a third party by Phigenics personnel (paid or volunteer) or contractor without the written consent of the individual.